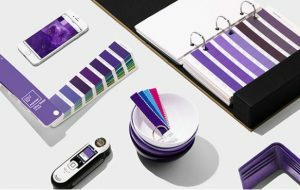 Described as “dramatically provocative” and signaling “originality, ingenuity and visionary thinking” in Pantone’s announcement as the 2018 Color of the Year, Ultra Violet adds a beguiling complement to any room in your home. How can you add a bold burst of color without overwhelming a room? Think in terms of accents rather than main focal points. Rather than painting all four walls, create a single accent wall with Ultra Violet—it’s blend of warm and cool tones enables it to mix with a variety of colors, from cool grays to playful pinks, warm yellows and muted blues. This guide will help you to mix and match colors to best suit your home and taste. In the living room, enhance a fundamental piece such as your sectional sofa with throw pillows in this complex color. For example, this mid-century modern sectional in classic gray would look fabulous with Ultra Violet throw pillows! Or perhaps a cozy blanket in Ultra Violet that you can drape over the back when not in use, as seen here. For a different twist on infusing an eye-catching burst of color, consider an area rug! From ornate Persian rugs to modern art-inspired geometric shapes to a muted solid-color version, an area rug enlivens any room with a fresh, sophisticated style. 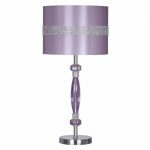 Similarly, add a pop of this chic color to your living room or bedroom by adding a lamp in Ultra Violet. A new lamp in this vibrant color will bring a charming contrast atop any end table or bedside stand. You can draw attention to the walls in any room with a piece of wall art in this intriguing shade. In the kitchen, you can easily add a splash of Ultra Violet with a set of new plates or placemats (or both!). This enables you to mix and match as you please without the expense or hassle of painting walls. At the center of your table or kitchen island, another inexpensive option is to add a purple flower vase…which of course you can fill with Violets! Since Ultra Violet has long had a spiritual quality to it and frequently associated with practicing mindfulness, it’s a natural fit in your bedroom. Accent pillows for your bed, or a new duvet in Ultra Violet, will help you to accomplish this as well. The possibilities for incorporating the 2018 Color of the Year in your home are vast. These are just a few ideas for you, and of course we welcome your suggestions too!